Foreign Affairs published op-eds recently to debate the for and against sides of drone warfare (although the against often sounds like a commendation of the program). Since I have made no secret about being against the policy, I’ll be taking a closer look at many of the points advocating for drones. Let’s get into it. Critics of drone strikes often fail to take into account the fact that the alternatives are either too risky or unrealistic…Worse yet, in Pakistan and Yemen, the governments have at times cooperated with militants. If the United States regularly sent in special operations forces to hunt down terrorists there, sympathetic officials could easily tip off the jihadists, likely leading to firefights, U.S. casualties, and possibly the deaths of the suspects and innocent civilians. The author here is admitting the only difference between drones and the alternatives is U.S. casualties since the other deaths would likely happen either way. In other words, the deaths of foreigners are acceptable, whether innocent or not. Can’t imagine why that position would anger anyone overseas. And this ignores the fact that, just maybe, governments are helping their own people because they are not fans of their sovereignty being violated by a foreign power and they look weak when their people are attacked. The author points out there are secret agreements between the U.S. and these governments but they still openly oppose them to their populations. This means, from the perspective of their citizens, anytime an attack happens their governments look weak and powerless against the U.S., further stoking hatred in the general population against America and creating more extremism. And even if a raid results in a successful capture, it begets another problem: what to do with the detainee. Prosecuting detainees in a federal or military court is difficult because often the intelligence against terrorists is inadmissible or using it risks jeopardizing sources and methods. And given the fact that the United States is trying to close, rather than expand, the detention facility at Guantánamo Bay, Cuba, it has become much harder to justify holding suspects indefinitely. It has become more politically palatable for the United States to kill rather than detain suspected terrorists. So, we have enough evidence to kill someone but we can’t prove that in a court of law? One way of looking at that is the part highlighted. Another, however, is the fact that more than half of the inmates at the mentioned Guantánamo Bay facility have been granted their release but still remain in prison. Which begs the question: are we choosing to kill because of the inadmissibility of evidence and giving up intelligence or are we doing it because we don’t want to admit we get info wrong about many suspects and do it more often than we want to acknowledge? Considering the facts, it’s a very fair question. Furthermore, although a drone strike may violate the local state’s sovereignty, it does so to a lesser degree than would putting U.S. boots on the ground or conducting a large-scale air campaign. This still ignores the fact that it’s a clear violation of international law and it angers people throughout the world, whether friend or foe, when the U.S. conducts these acts regardless of which we choose. 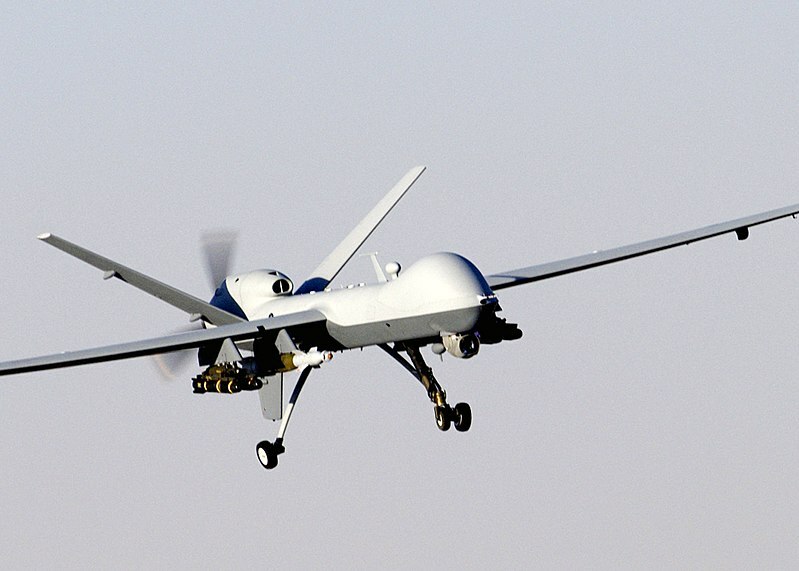 The anti-drone argument gives some of the international polling data on drones with “Turkey (81 percent against), Jordan (85 percent against), and Egypt (89 percent against)…51 percent of Poles, 59 percent of Germans, 63 percent of French, 76 percent of Spanish, and a full 90 percent of Greeks” opposed to the policy. And it should be noted those countries are not the ones being attacked with drones. Posted on June 24, 2013 by Paul PhillipsPosted in Media, Politics, UncategorizedTagged drone attacks, drone policy, drones, foreign policy, u.s. foreign policy.